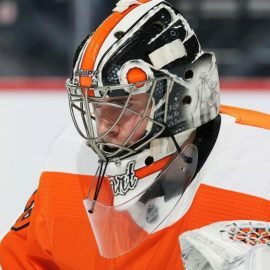 Already having earned NHL Rookie of the Month honors in January and a leaguewide Second-Star of the Week selection for the week ending February 3, Flyers goaltender Carter Hart outdid himself in Monday night’s 2-1 win over the Vancouver Canucks. Hart made 41 saves on 42 shots. His night’s work included a puck off his mask, several saves from the doorstep or on open shooters in the slot and a host of clean saves on tougher-than-average chances that he made look routine. Even so, there was only one play that astounded even his teammates and confounded the Canucks. It was the same one everyone wanted to talk about after the game. With the Flyers clinging to a 2-1 lead and their best two-way center, Sean Couturier, in the penalty box, the Canucks’ Nikolay Goldobin had the game-tying goal on his stick with 5:35 left on the clock. Teammate Elias Pettersson, one of the NHL’s deadliest young snipers, put the puck at the net from the top of the right circle. Hart had the angle covered. However, the puck went off Flyers’ defenseman Ivan Provorov in front and went directly across the slot to Goldobin in point blank range at the bottom of the circle. With Hart seemingly having too far to get over, Goldobin got off a rising shot headed for the short side. Somehow, though, Hart was already there. Diving across with his glove already perpendicular to the post, the Flyers’ rookie goaltender made an arm save on the shot. Essentially, it was a combination of technique, smarts, and athleticism that created some self-made good luck. “To make a save like that, there’s a couple of things. You have to be technically sound before that shot is even taken. The puck rebounded or hit somebody and went across,” Gordon said. As for Hart himself, the 20-year-old rookie was matter-of-fact about the play that made highlight reels across the league as his team won for the eighth straight game and Hart ran his personal winning streak to seven. As with most athletes, he simply felt he acted within the moment. “I don’t know. I just sort of saw the play bounce out to my guy on the side and just dove across and was hoping it hit me and it did,” Hart said. After the game, Hart’s Flyers teammates were still marveling at the 20-year-netminder: the one play in particular, but also his overall body of work. “He’s making some miracles out there. It’s nice to have him back there. You know he can steal one,” Couturier said. Flyers center Nolan Patrick, himself 20 years old, saw some of what Hart can do during their time in the Western Hockey League. Patrick’s Brandon Wheat Kings periodically played against Hart’s Everett Silvertips. Together now as NHL teammates, Patrick’s appreciation for Hart’s talents has only grown. “I knew he was good and he was highly talked about, but I didn’t know he was that good. He’s going to be a superstar for a long time so it’s obviously nice to have him on your end,” Patrick said. Even those on the Canucks’ side had to send credit the way of the opposing netminder for essentially robbing them of at least one point from the game. Hart has been “in the zone” for over a month, dating back to his last few American Hockey League starts before he was called up to join the NHL team. In his 16-game NHL career, he’s already earned first-star honors five times (including Monday night), second star once and third star three times. Throughout Monday’s game, Hart’s puck tracking was nothing short of outstanding. He was so locked in that he didn’t hear the chants of “Car-ter! Car-ter! Car-ter!” going on in the stands and was seemingly imperious to traffic, screens, and chaos around the net. “It’s just trying to focus on one play at a time and battle as much as I can, some plays there are loose pucks and everything, but the guys did a good job of boxing guys out and putting pucks in the corner, got a couple of key blocks there at the end. So, I’m really just trying to compete,” Hart said with a grin and a shrug. Hart, who will back up Anthony Stolarz on Thursday against the LA Kings, recorded his seventh consecutive victory (7-0-0, 2.26 GAA, .934 SV%) amid the team’s eight-game winning streak. He becomes just the fourth goaltender age 20 or younger to post a winning streak of seven or more games. The others: Carey Price (7 games, March-April 2008), Tom Barrasso (7 games, Dec 1984 – Jan. 1985) and Jocelyn Thibault (8 games, March 1995). “Every team that is successful has a goaltender that is going to give you a lift at some point. Obviously him being 20 years old is even more substantial, I don’t want to say we’re expecting him to fail, you just find it hard to believe that someone his age can come in and do what he’s been able to do so far,” Gordon said.